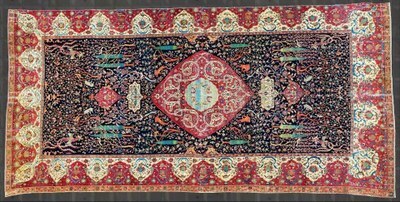 There is a magnificent Safavid 16th century carpet Size 517x217 in THE MIA Museum of Islamic Art in Qatar of which the origin is not clear. 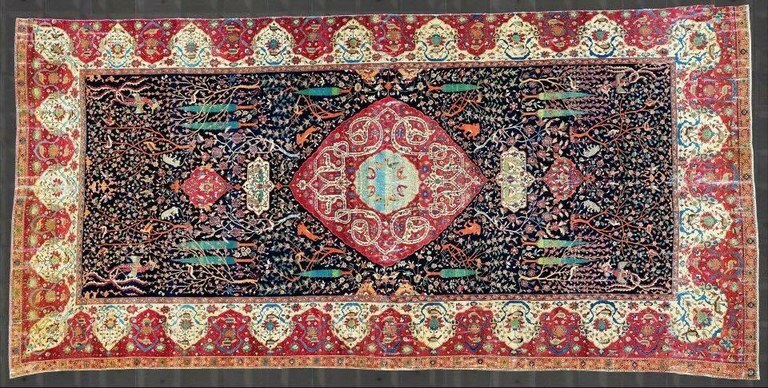 What is known is that this magnificent piece belonged to the Schwarzenberg family for centuries and was housed in their residence in Palais Schwarzenberg, Vienna, so to gather more information on the carpet it is always good to start with its’ provenance. The Schwarzenberg family’s history starts with the Lords of Seinsheim, who had established themselves in Franconia during the Middle Ages. A branch of the Seinsheim family (the non-Schwarzenberg portion died out in 1958) was created when Erkinger of Seinsheim acquired the Franconian territory of Schwarzenberg and the castle of Schwarzenberg in Scheinfeld during the early part of the 15th century. He was then granted the title of Freiherr (Baron) of Schwarzenberg in 1429. At that time, the family also possessed some fiefdoms in Bohemia. In 1599, the Schwarzenbergs were elevated to Imperial Counts, and the family was later raised to princely status in 1670. In 1623 came the Styrian Dominion of Murau into the Schwarzenberg family due to the marriage of Count Georg Ludwig of Schwarzenberg (1586 - 1646) with Anna Neumann von Wasserleonburg (1535 - 1623). Furthermore, the House of Schwarzenberg acquired extensive land holdings in Bohemia in 1661 through a marriage alliance with the House of Eggenberg. In the 1670s, the Schwarzenbergs established their primary seat in Bohemia and, until 1918, their main residence was in Český Krumlov, Bohemia (now in the Czech Republic). At the beginning of the 19th century, the House of Schwarzenberg was divided into two princely-titled lines. This division was already foreseen in the will of Prince Ferdinand (*1652 - †1703). However, the absence of two male heirs until Joseph II. and Karl I. Philipp inhibited the execution. The senior branch,which held not only the Palais Schwarzenberg in Vienna, but also the Dominions of Scheinfeld, Krumlov, Frauenberg and Murau, died out in the male line in 1979 upon the death of Joseph III of Schwarzenberg, who was the 11th Prince of Schwarzenberg. The cadet branch, which was established by Karl Philipp, Prince of Schwarzenberg at Orlík Castle, continues to the present day. The two branches have now been re-united under the current head of the family, Karl VII of Schwarzenberg, who is the 12th Prince of Schwarzenberg. He is a Czech politician and served as Minister of Foreign Affairs of the Czech Republic. Karl Philipp Fürst zu Schwarzenberg (or Charles Philip, Prince of Schwarzenber, 1771 – 1820, creator of the cadent branch) was an Austrian field marshal and the son of Johann Nepomuk Anton of Schwarzenberg and Marie Eleonore Countess of Öttingen-Wallerstein, He entered the imperial cavalry in 1788, fought in 1789 under Lacy and Loudon against the Turks, distinguished himself by his bravery and became a major in 1792. In the French campaign of 1793 he served in the advanced guard of the army commanded by Prince Josias of Coburg and at Le Cateau-Cambrésis in 1794 his impetuous charge at the head of his regiment, vigorously supported by twelve British squadrons, broke a whole corps of the French, killed and wounded 3,000 men, and captured 32 of the enemy's guns. He was immediately decorated with the Knight's Cross of the Military Order of Maria Theresa.